Took Friday off of work to properly break in my new camera at Bolivar Flats with a little sand and salt water. It was low tide at sunrise but most of the sandbars were covered in seaweed. Just as well since I forgot to take my rubber boots with me. The outing started out slow with some Willet shots at a distance but ended up great with getting head shots of Avocets and a Reddish Egret. Relocated my position a couple of times and ended up with two options. Off to my left was a group of Brown Pelicans/Black Skimmers and off to my right was a Reddish Egret with a few Avocets near by. Not likely to get close to the Pelican’s without spooking them so I headed towards the Reddish Egret. Couldn’t get real close without my boots so ended up picking a spot upstream of the Egret and laid down with my ground pod hoping that the birds would come to me. I love it when a plan comes together. The Reddish Egret ended up going right by me and two of the Avocets walked right towards me. One ended up being too close to get a full body shot so I focused on the top half of this body. Minor cropping to reposition him in the frame gave me this shot. Losing the crop factor from my 7D won’t be a big deal when the birds cooperate like this. Only minor adjustments in Photoshop with saturation/contrast for this photo. No sharpening was required in Photoshop. Something tells me that I’m going to like my 1DX/500mm combo. This entry was posted on May 24, 2014 by Tim Timmis. 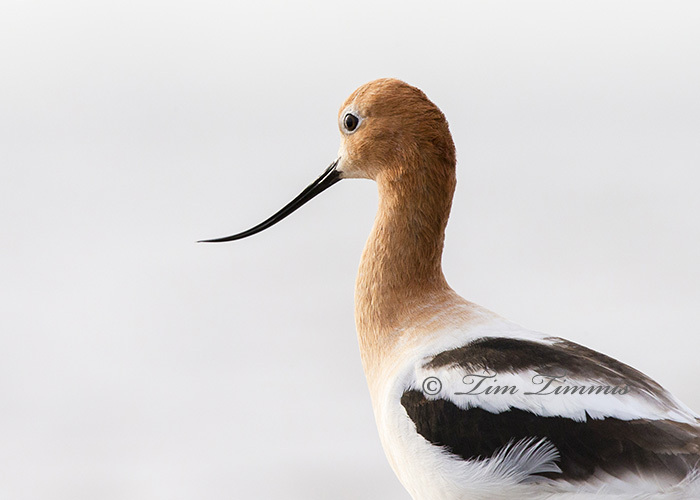 It was filed under Birds and was tagged with American Avocet, avocet, Bolivar Flats, Canon 1.4x III, Canon 1DX, Canon 500mm F4 IS II, Skimmer ground pod, Wimberley II. Plain and simple…awwwesome. Clean background, beautiful catch light with tack sharp image. I might have cost you some money letting you try out my 1DX, but you’ll never look back. Thanks Doug. I was pretty much convinced that I was going to get one and trying out yours confirmed my instinct. Thanks again for letting me play. It’s a keeper. Looks like a great start to a wonderful relationship with your 1DX. Thanks David. It was good to see you yesterday. Being too close is just one of those delicious ironies when you have a long lens. It’s a good problem to have and I’m cherishing it every time that it happens.